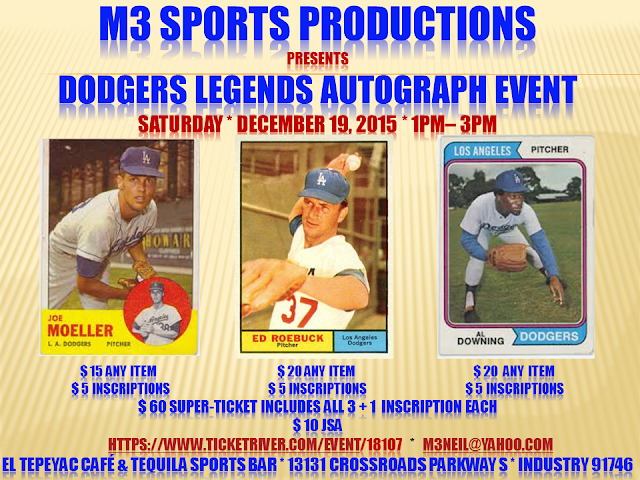 M3 Sports Productions proudly presents Los Angeles Dodgers Legends: 3x World Series Pitcher, All-Star, Strikeout Leader, and Comeback Player of the Year, AL DOWNING; World Series Pitcher and World Series Champion Advance Scout, JOE MOELLER; and World Series Champion, ED ROEBUCK. Ralph Mauriello and Pete Richert has been added to this event. Mark Cresse has been added.